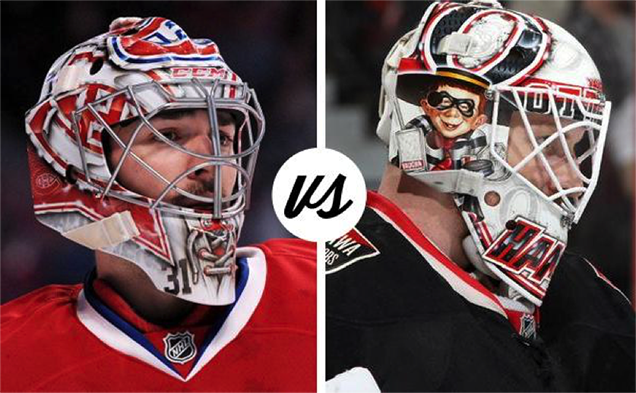 In an all-Canada, veteran-versus-newcomer matchup, Carey Price and the Canadiens take on the Hamburglar, Andrew Hammond, and the red-hot Senators, who surged their way into a playoff position at the tail end of the season. 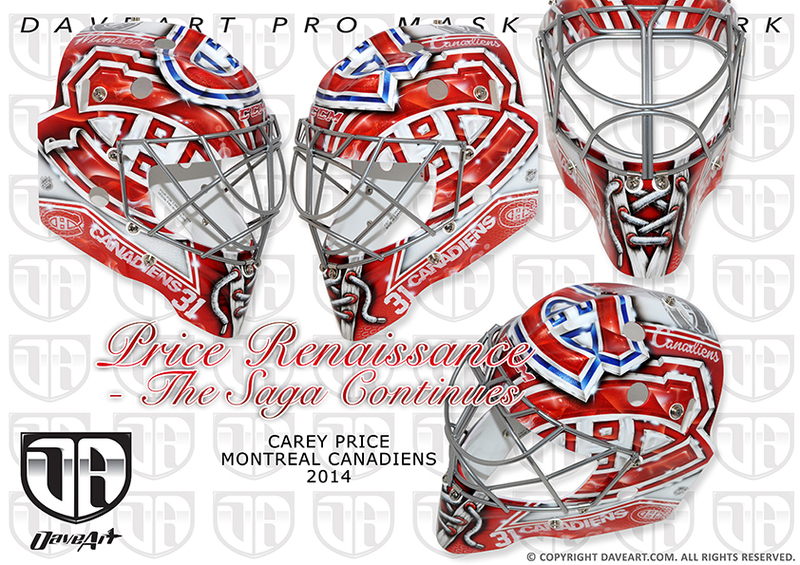 Like the goaltenders wearing their creations, Price’s artist, Dave Gunnarsson, has worked with more than half the NHL’s netminders, while Jason Bartziokas’ work is well-established around the CHL but is making it’s way on to the big stage. Fundamentally and style-wise these masks are surprisingly similar, considering they’ve come from two different artists on two different continents. By now we’re more than familiar with Gunnarsson’s hyper-detailed style and signature special effects, but Bartziokas incorporated many similar elements in creating the Hamburglar’s mask as well. Bartziokas, like Gunnarsson, used the Senators’ logos as design treatments, creating a pattern within the large ‘O’ and throughout the mask. 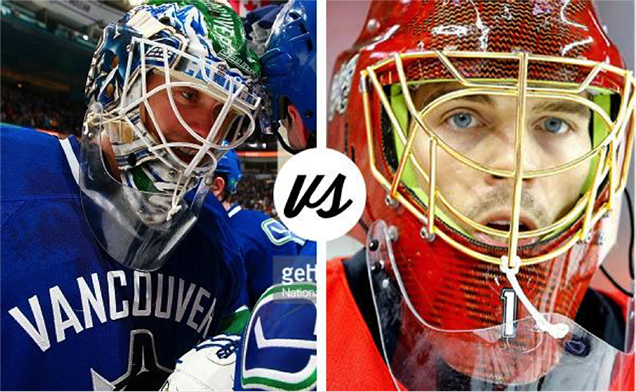 The Hamburglar in goalie gear on the right takes a playful approach to Hammond’s now famous nickname, and is executed with incredible detail. This matchup, because of its close similarities, comes down to the wire, but ultimately, the small details in Gunnarsson’s work have to win out in the end. 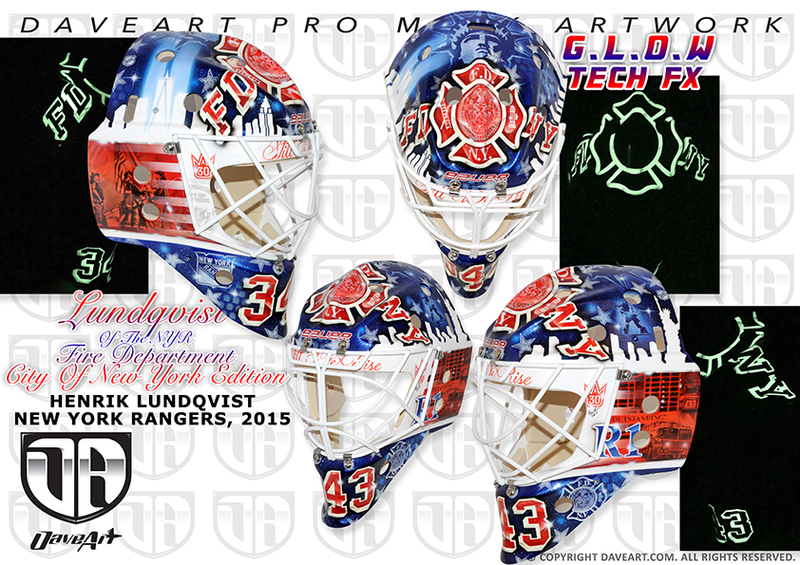 Since mask machine Dave Gunnarsson has crafted numerous buckets for King Henrik this season, for the purposes of the first round, we’ll look at his most recent creation, a FDNY tribute that was featured on MSG’s television series, The Mask. Fleury on the other hand, threw back to the past with a homage to Tom Barrasso, Penguins goaltender from 1988-99, painted by Stephane Bergeron at Griffe Originale. These two masks – while both well crafted and thought out – couldn’t be more different. Gunnarsson’s FDNY design is incredibly detailed, incorporating imagery of firefighters raising the flag post-September 11th and the world-famous Rescue 1 unit. Along the top sits a silhouette of Lady Liberty and the phrase “still we rise.” Fleury’s mask, on the other hand, has a lot less going on, but makes a bolder and more graphic statement. In alignment with the Pens new third jerseys (for better or for worse) Bergeron went full-on retro with color blocking and a yellow lacquered cage. 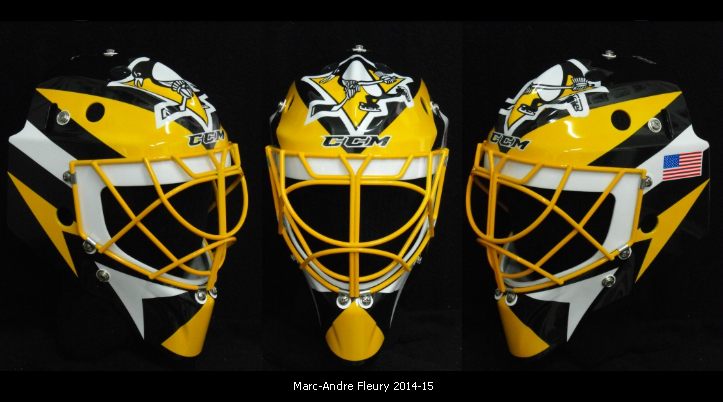 This one really is a matter of personal taste, as both masks are well executed by well-respected artists, but I have to give an edge to Fleury’s graphic style, as many of the beautiful details put into Gunnarsson’s tribute mask are bound to get lost from those upper balconies of Madison Square Garden. In a battle of original-6 versus 90’s expansion, for the first time this postseason we have a Gunnarsson-versus-Gunnarsson matchup. 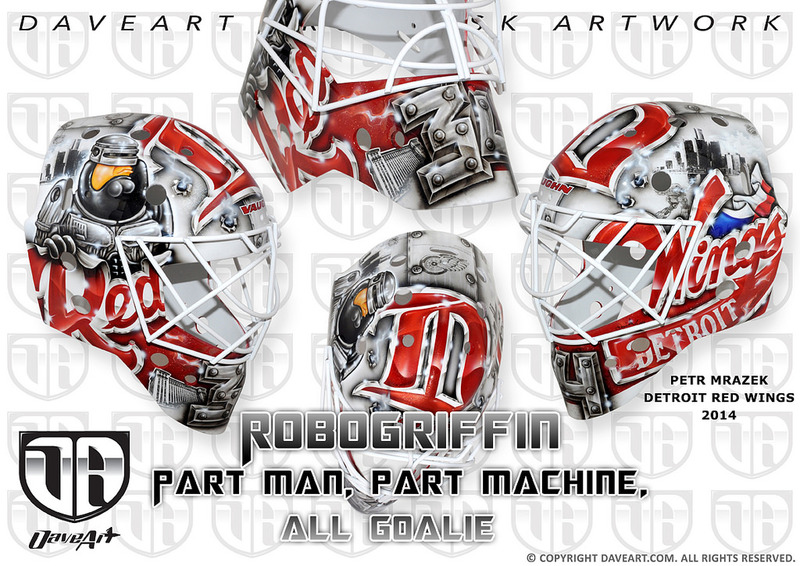 Aside from his festive holiday mask, Mrazek has been sporting another Family Guy-themed bucket this season painted by who else, Dave Gunnarsson. In the spirit of Detroit’s metallic nickname, Gunnarsson transformed Mrazek’s favorite character into a steel-clad robo cop, surrounded by the Detroit skyline and Red Wings logos. 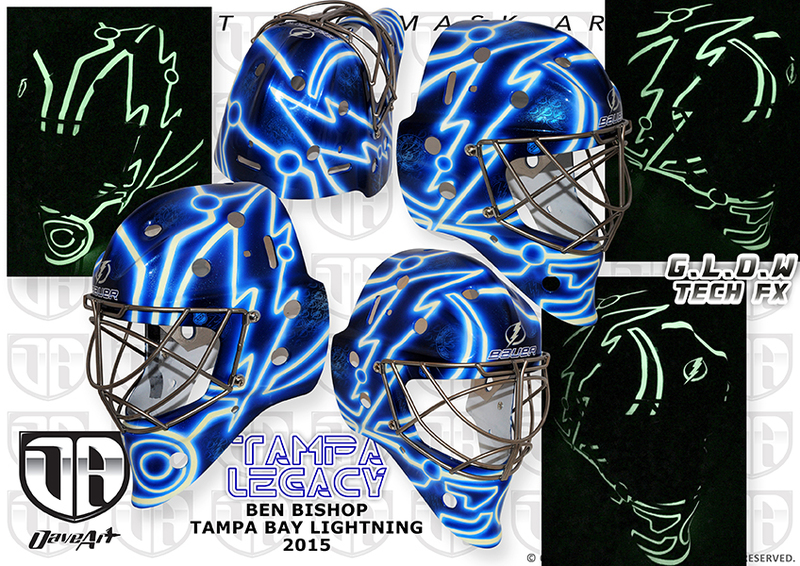 With a completely different design approach (yes, these were indeed painted by the same artist) is Gunnarsson’s work on Ben Bishop’s electric, glow in the dark mask. If Mrazek’s is the tried and true reliable player of masks, Bishop’s is the hyped up new rookie who’s faster, younger and hungrier than all the old veterans around him. Not only is this lightning-themed design exciting and unique under the bright lights of the ice, but Gunnarsson has really paved the way in using glow in the dark paint in his work. 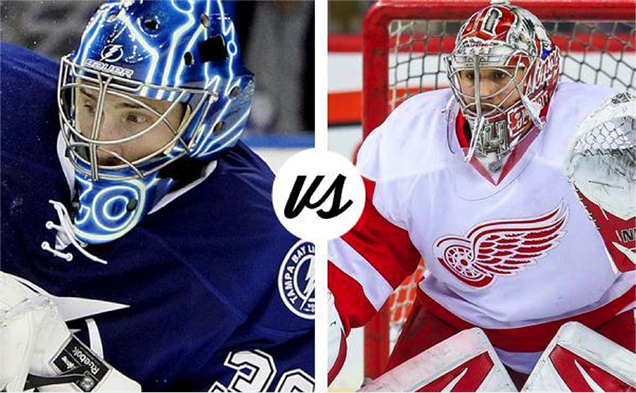 Both these masks are beautifully painted and well designed, but Family Guy is just no match for Bishop’s neon flash. 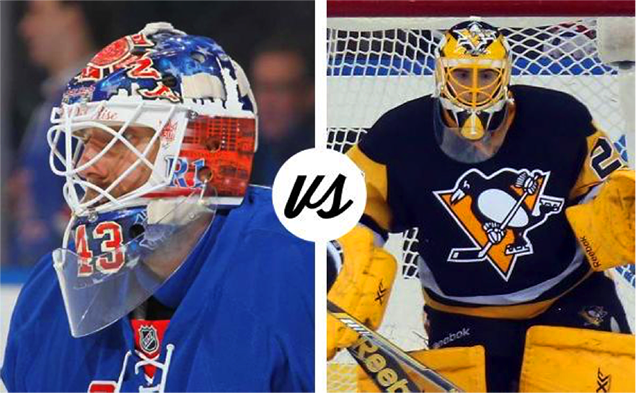 With the Caps and Isles, we have ourselves another tight matchup, as both these masks have great style and are well-executed. With Holtby’s, we have yet another Daveart masterpiece with incredible detail and the Caps’ wordmark perfectly placed, wrapping around the top edge of the mask. 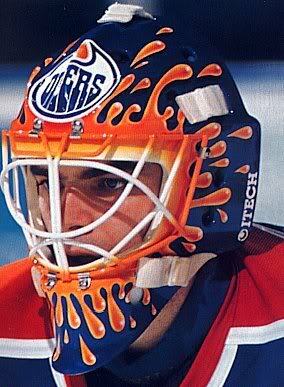 Halak’s, painted by David Leroux at Diel Airbrush, pays homage to Cujo’s old Oilers mask, even adding some extra retro flair with the orange lacquered cage. 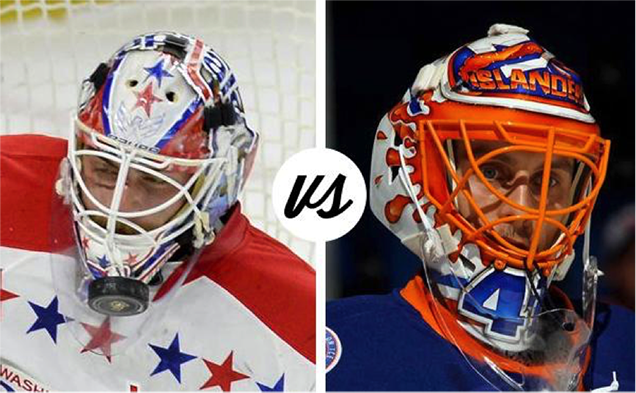 Both paint jobs are incredibly crisp and clean and do a great job of balancing detail work with bold graphics, but the historic nod and bold orange cage give Halak a slight edge, ultimately making him the victor of this matchup. 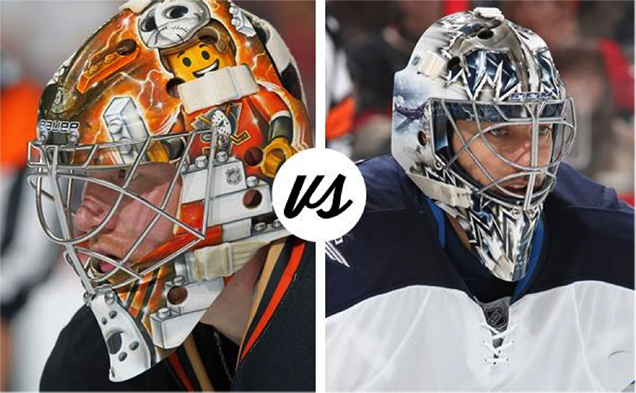 In a true battle of the wild (no pun intended) kingdom, the first matchup in the west is moose-against-giraffe with Elliott and Dubnyk’s signature animal masks. 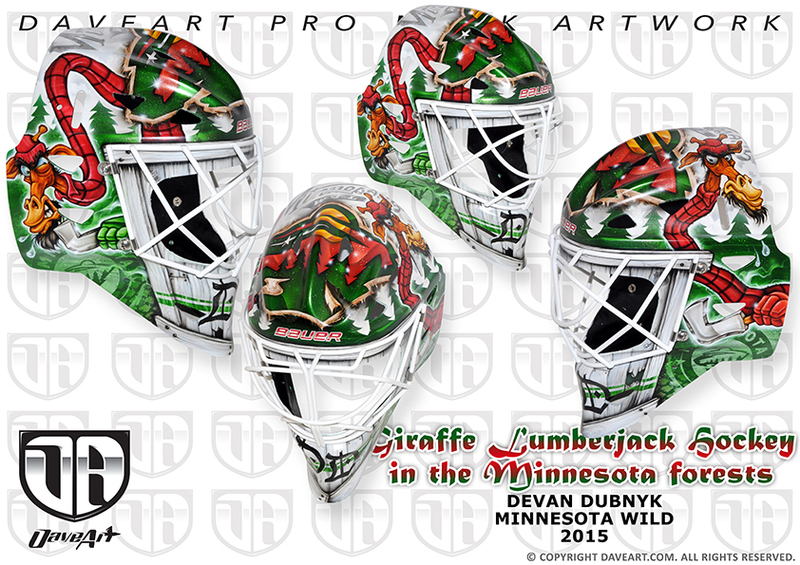 Ellliott’s takes a more abstract approach to the animal motif, while Dubnyk’s cartoon giraffe roaming the Minnesota forest is more literal (er, well in artistic execution at least). To Gunnarsson’s credit, it’s hard to make anything about a giraffe deep in the woods of the Minnesota credible or cool, but Livery’s artistic moose interpretation takes the cake, almost by default. 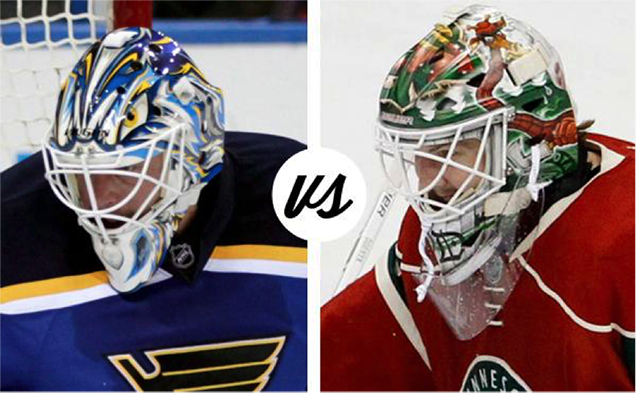 We have ourselves yet another Gunnarsson-versus-Gunnarsson matchup, and naturally, both masks are outstanding. 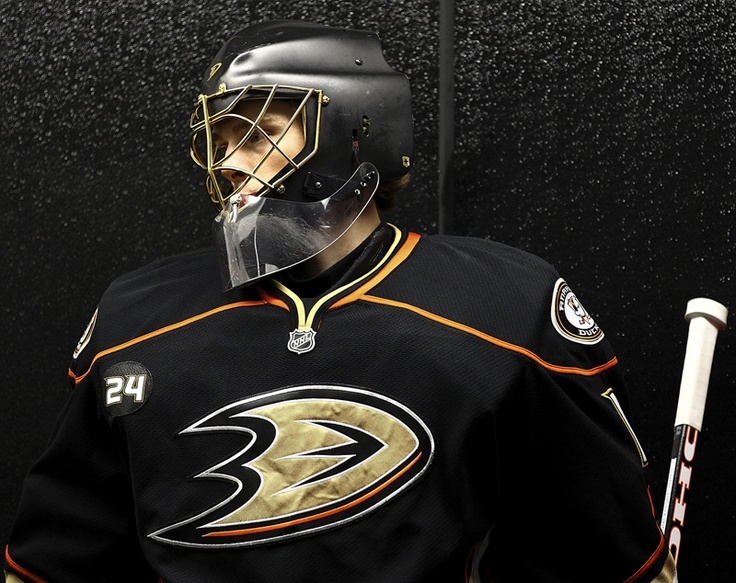 The Anaheim Ducks have been a force to be reckoned with all season, and Frederik Andersen’s Lego man mask is no different. Both a playful take on the commonly used “brick wall” concept and a nod to his home country of Denmark (also home to Lego), Andersen’s bucket has continued to garner positive attention from the first time it hit the ice back in the fall. 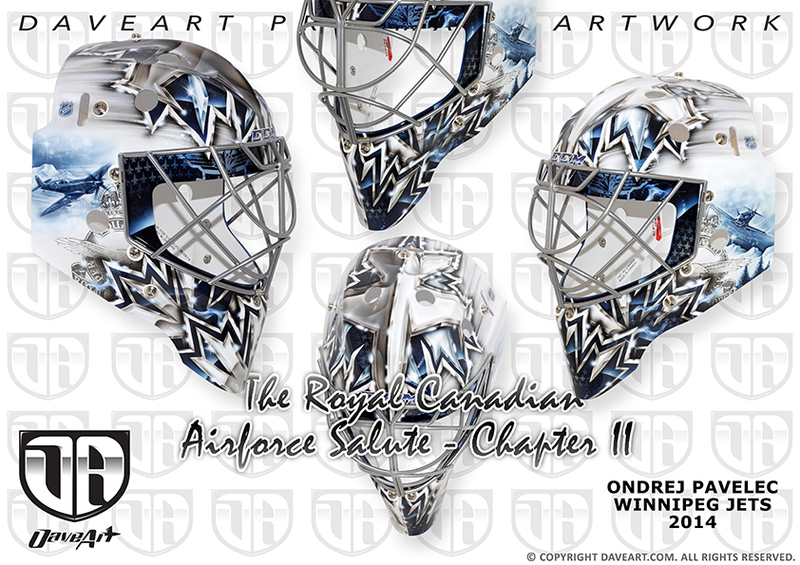 Pavelec’s mask, while stylistically very different, is equally as stunning, with hyper-realistic fighter jets brushed on each side and chromed-out Jets logos spanning the length of the front. While both are beautifully executed, the creativity of Andersen’s lego concept gives Anaheim just the extra bump they need to sail into the second round. 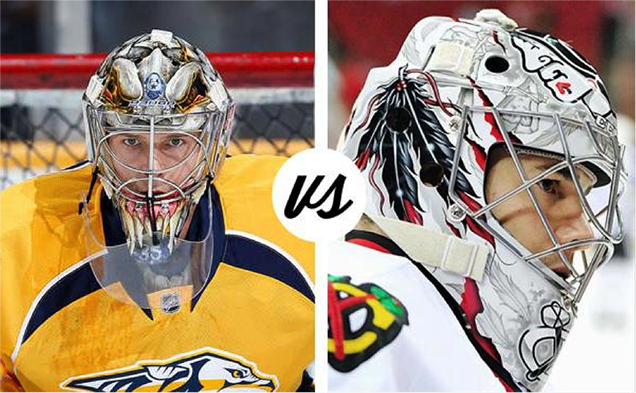 The first round clash of Nashville and Chicago brings us two of the league’s top netminders in a battle of wacky versus understated in terms of mask style. Rinne, who is notoriously superstitious about his equipment (including his masks), has been sporting yet another Dave Gunnarsson creation, that appears as some kind of gladiator/beast fusion. 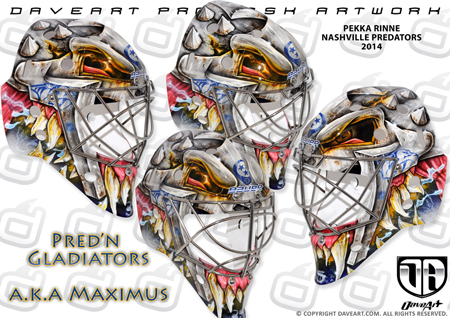 As I touched on in our preseason mask roundup, the detail work in this design is remarkable, but the colors and overall design are difficult to read from afar, and the blue and red tones don’t exactly play well off the mustard yellow of Nashville’s jerseys. 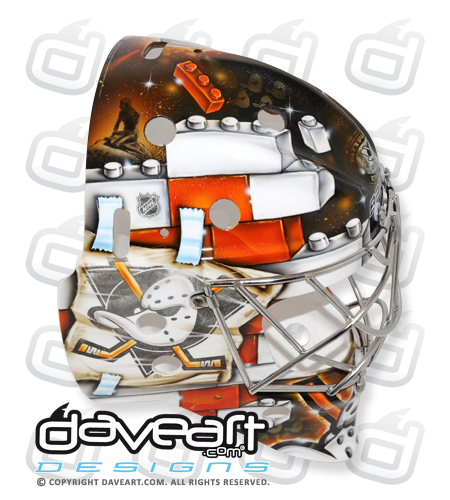 Crawford on the other hand, went simple and clean with his tried-and-true design, painted once again by Stephane Bergeron. 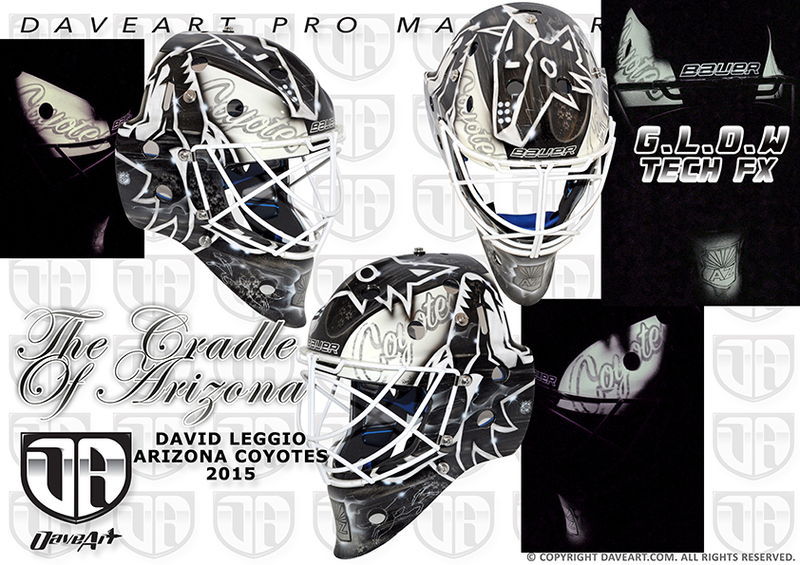 We don’t see many black and gray masks around the league (Gunnarsson actually recently created a glow-in-the-dark black and white mask for David Leggio in the Coyotes organization), so Crawford’s muted mask is a refreshing change. The pale gray is a bit tricky in terms of having little to no contrast with the Hawks’ road jerseys or the ice, but the bold, desaturated logos on the front and rich black feathers on the side really pop along with the hints of red. 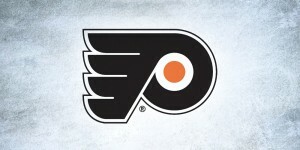 These masks are drastically different in style, but the successful use of team branding and unique palette earn Crow and the Blackhawks the first round win. 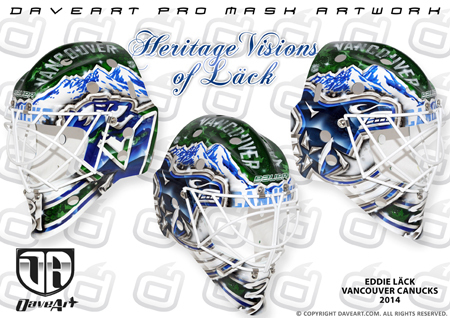 In true Dave Gunnarsson style, Lack’s latest mask uses incredible detail to bring together the Canucks’ past and present. The mountain landscape is eclipsed by the ‘Nucks orca logo on one side and Johnny Canuck on the other. 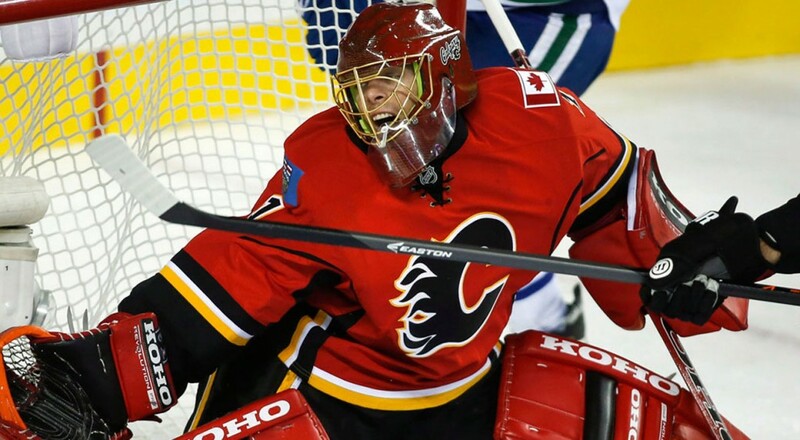 Hiller, no stranger to forward-thinking graphic masks, has been wearing a more abstract look so far in Calgary. 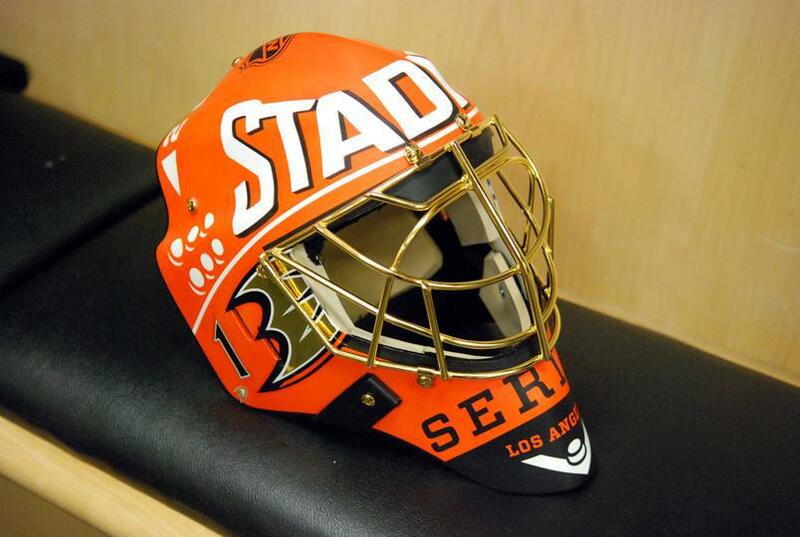 We’ve seen Hiller repeatedly sport some bold designs, including his Stadium Series “wheaties” and “Darth Hiller” looks in Anaheim, also painted by Alec Voggel at Airxess, and his new, red Calgary bucket is no exception. 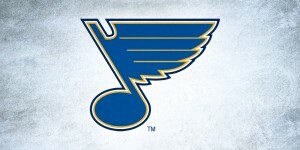 Garnering some criticism at first, the “big red lid” has seemed to grow on Flames fans, having learned to appreciate its simplicity and intriguing textural patterns. The mask almost appears to have a mesh overlay, only broken by the gold chrome cage and small Calgary wordmark on the side. 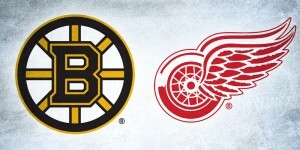 This Pacific division showdown comes down to detail versus concept and may be a controversial decision (there’s no video replay for design, folks), but I’m giving this one to the red bucket. Agree? Disagree? Let us know who you would pick in the comments below, or on Twitter or Facebook! And remember to check back in a couple weeks for Round 2.